From a culinary standpoint, during previous trips to Venice, Italy, I contented myself with taking the easy road - that is, leave my hotel and start walking until I am lost - that would take on average about 10 seconds. Then find a restaurant that looks bereft of tourists, the sort of place that only true Venetians would know about. Enter, order a simple plate of pasta and a bottle of wine, and find oneself in Venetian heaven. So much for the easy road - now that I am penning - can one pen anything online? - a restaurant blog, my standards have risen and during my late January trip, I arrived at Marco Polo airport fully armed with a list of go-to venues. Yep, closed again. Closed, and no cigar. So no, apparently that is not an Italian thing that I mentioned before, and when Italians go on vacation during a week, you can count on their being away day and night. At least that makes more sense. But I was still out a couple meals. So here's what I did. For dinner, I walked half a block down and on the other side of the street was one of those little trattorias that I used to stumble into blindly and hope I could get an authentic Italian meal. 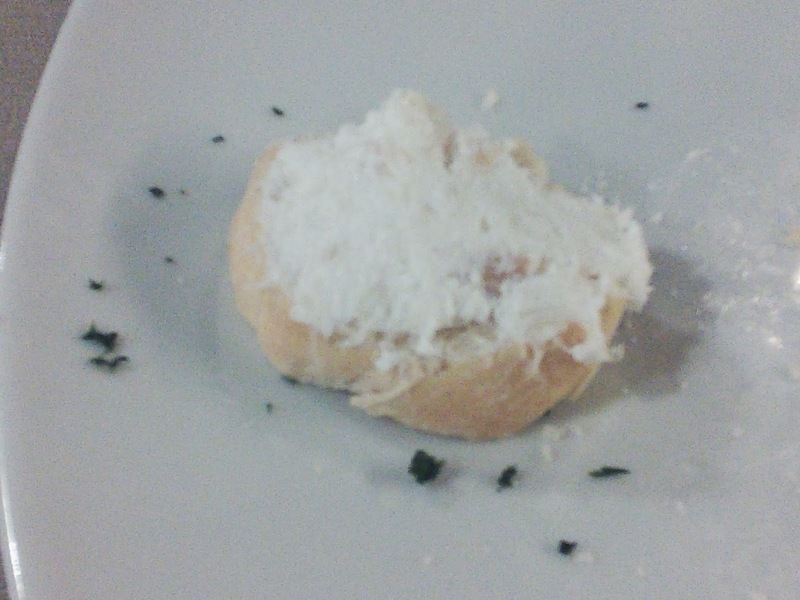 This turned out to be a pretty good choice, and the next day I read quite a lot good about Osteria Ae Cravate. Only a few tables were taken when I entered around 8 pm, with a few more filling up during the course of the evening. The next day, however, they seemed to be doing a pretty brisk lunch business. The padrone in chief did a pretty good job of lending a warm, traditional atmosphere to the place, and we bantered a little in his broken English and my non-Italian. 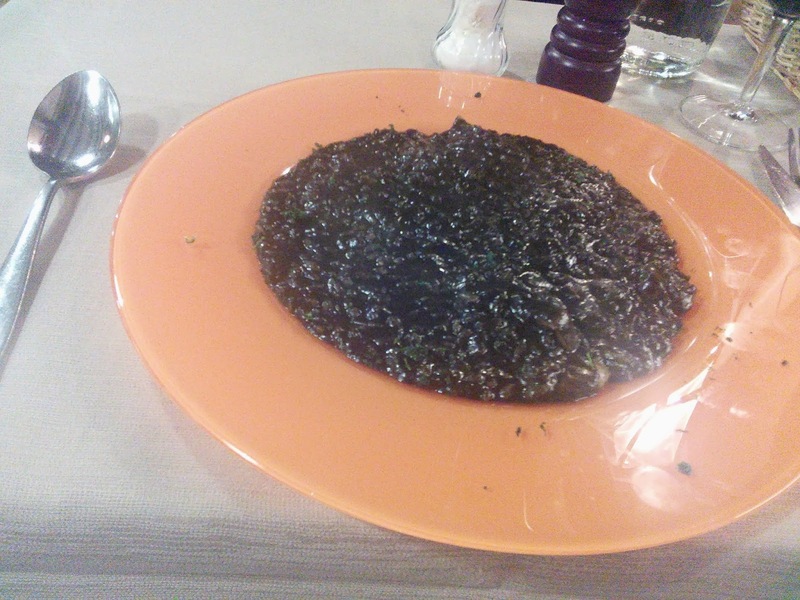 After a mise en bouche offering of white fish on toast I started off with an excellent primo platto of risotto in black ink with sepia, one of my favorites. I must admit, with a couple glasses of wine, the bread, and the risotto, I was good to go - that is, sated. 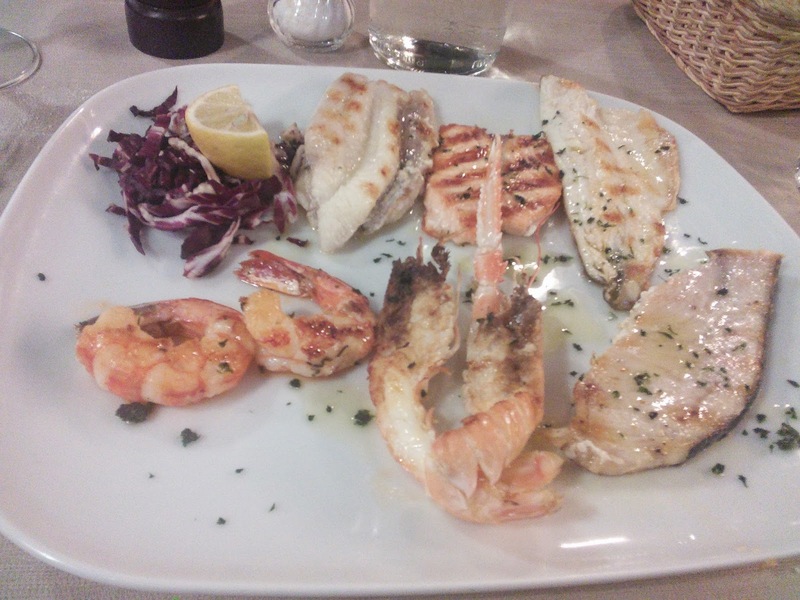 But I had ordered a secondo, a grilled fish platter. This was a real miss - the seafood was excellent - succulent and sweet - but the fish was dry and all tasted the same. I couldn't finish it. My guess is that Osteria does pasta and rice plates right - stick with those, go for lunch, and you should be pretty satisfied. 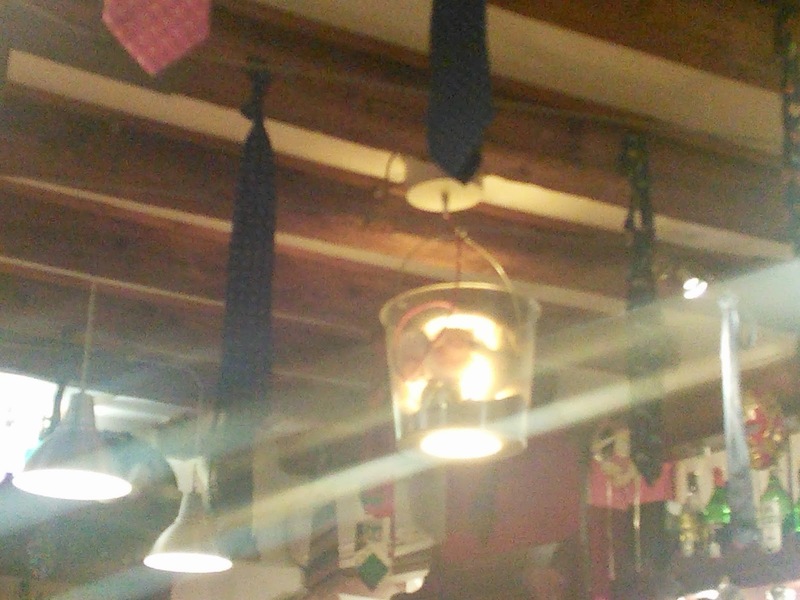 Sorry, I have no idea what is the origin of the tie/cravate motif - I can only guess. Speaking of lunch, my second strike at Ribot was no big deal - I expected them to be closed for lunch, being the astute professor of vacations myself, I figured if you're on vacation the night before, there's a good chance you'll be on vacation the afternoon after. As mentioned, this assumption proved correct. So I was armed with some alternatives. The first was recommended by my hotel, Al Vecio Pozzo. The directions seemed simple - a 5 - 10 minute walk from the hotel. Well, maybe it's me, but it is bloody near impossible to find anything in Venice, directions, GPS, free-roaming satellite, or not. By the time I found Al Vecio it may have been lunch time the next day for all I know. I would not be deterred, I found it, and it was closed (and it was still lunch time, by the way). Don't ask me, I tell you what I know, and what I know is that it seems that a lot of Italian restaurateurs take their vacations around the end of January. And by the looks of Al Vecio, that vacation had started a few decades earlier. Fortunately, my next choices panned out.